This is the opening line of Madeleine L’Engle’s A Wrinkle in Time, quoted to remember the good times she gave our family. She died Thursday, September 6, in Litchfield, CT. She was 88 years old. Following are excerps from the NY Times story, “Madeleine L’Engle, Writer of Children’s Classics, Is Dead at 88” of September 8, 2007. Madeleine L’Engle, an author whose childhood fables, religious meditations and fanciful science fiction transcended both genre and generation, most memorably in her children’s classic “A Wrinkle in Time,” died on Thursday in Litchfield, Conn. She was 88. Her death was announced yesterday by her publisher, Farrar, Straus & Giroux. A spokeswoman said Ms. L’Engle (pronounced LENG-el) had died of natural causes at a nursing home, which she entered three years ago. 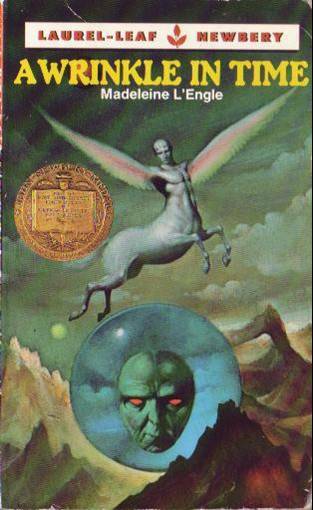 Before then the author had maintained homes in Manhattan and Goshen, Conn.
“A Wrinkle in Time” was rejected by 26 publishers before editors at Farrar, Straus & Giroux read it and enthusiastically accepted it. It proved to be her masterpiece, winning the John Newbery Medal as the best children’s book of 1963 and selling, so far, eight million copies. It is now in its 69th printing.
. . . it was in her vivid children’s characters that readers most clearly glimpsed her passionate search for answers to the questions that mattered most. She sometimes spoke of her writing as if she were taking dictation from her subconscious. “Wrinkle” is part of Ms. L’Engle’s Time series of children’s books, which includes “A Wind in the Door,” “A Swiftly Tilting Planet,” “Many Waters” and “An Acceptable Time.” The series combines elements of science fiction with insights into love and moral purpose. 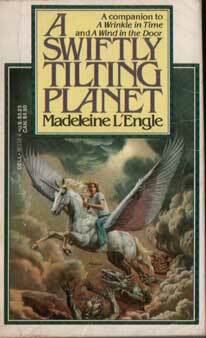 Madeleine L’Engle Camp was born in Manhattan on the snowy night of Nov. 29, 1918. The only child of Madeleine Hall Barnett and Charles Wadsworth Camp, she was named for her great-grandmother, who was also named Madeleine L’Engle. Her mother came from Jacksonville, Fla., society and was a fine pianist; her father was a World War I veteran who worked as a foreign correspondent and later as drama and music critic for The New York Sun. He also knocked out potboiler novels. The family lived on the Upper East Side of Manhattan. Her parents had artistic friends, and Madeleine an English nanny. She felt unpopular at school. She said that an elementary school teacher — Miss Pepper or Miss Salt, she couldn’t remember which — regarded her as stupid. Madeleine had written her first story at 5 and retreated into writing. When she won a poetry contest in the fifth grade, her teacher accused her of plagiarizing. Her mother intervened to prove her innocence, lugging a stack of her stories from home. Returning to New York, Ms. L’Engle began to get small acting parts. Several plays she had written were produced. She published her first novel, “The Small Rain,” in 1945. And she met the actor Hugh Franklin while they were touring in a production of Chekhov’s “Cherry Orchard.” They married in 1946. “I think that fantasy must possess the author and simply use him,” she said in an interview with Horn Book magazine in 1983. “I know that is true of ‘A Wrinkle in Time.’ I cannot possibly tell you how I came to write it. It was simply a book I had to write. I had no choice. For more than three decades, starting in 1966, Ms. L’Engle served as librarian and writer in residence at the Cathedral Church of St. John the Divine. One or two of her dogs often accompanied her to the cathedral library. Most of us can only remember the names of 2 or 3 of her books, but she was a very prolific writer.